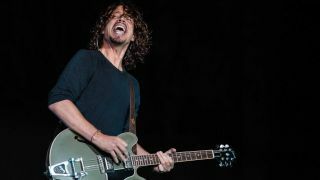 Although Soundgarden and Rage Against The Machine co-venture Audioslave ended on uncertain terms back in 2007, guitarist Tom Morello and now singer Chris Cornell have said they would be keen to reboot the supergroup, their flames reignited by recent gigs together in Seattle and at the Rock and Roll Hall of Fame. In an exclusive Total Guitar interview, Cornell had the following to say on a reunion. "I think it would be great. We did a lot of songs, and with the benefit of not having done anything with those guys for so long, I can't imagine what it would be. It would be a really amazing experience just to get back and work with the same guys again. "We were certainly a prolific group of people; we wrote three whole albums in around five years, maybe less. And these were albums that were raw, and we had extra material, and we just never seemed to have trouble ever trying to agree on what would come out of the songs. "They were great guys, and I really enjoyed the experience that I had with them, so yeah, I would always be open to doing something." Keep your eyes peeled for the full interview with Chris in a future issue of Total Guitar.